well as some of you know, i blew the motor on my track oriented hawk. after replacing the motor with a motor that previously had a CCT failure that the PO failed to mention i decided to cut my losses and go back to only having one hawk. 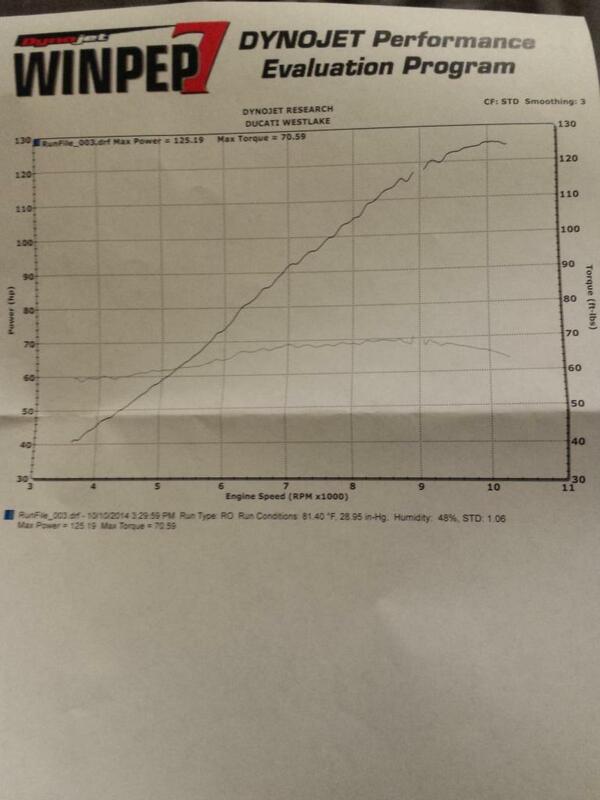 the best part is the amazingly flat torque curve with 60 ft lbs pretty much out of the gate. plus a really smooth power curve all the way up the rev range. i love twins! the RC is a bike ive wanted for a long time. not as a replacment for the hawk but a different breed sorta speak. loving the bike so far! its hard to compare it to the hawk as its a totally different type of ride. deffinatley a race track pedigree in the RCs chassis. its a harsh ride at anything less than a pretty quick pace. its not the all around machine we all know and love with the hawk. its designed for one purpose and thats to haul *** around a track. im pretty stoked to own both the VTRs. 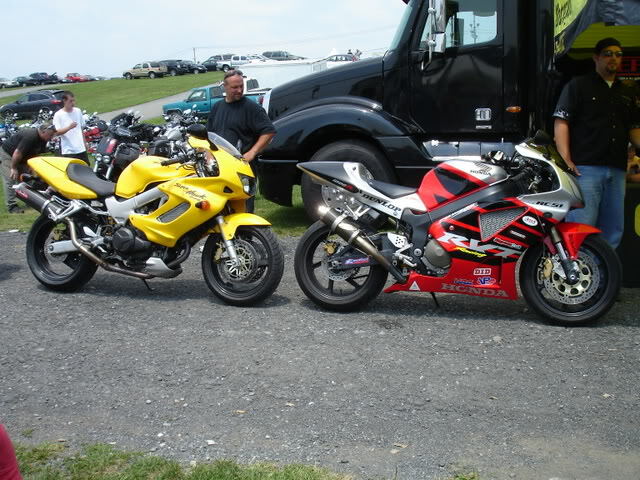 i might end up selling the Duc although that has another place in my heart so im not sure yet. Is this your new track bike ? I hate you Scobey ! But as I have now disposed of the Tuono I have some cash in the cunning kick that the missus is not aware of so who knows!!!! Prices here in Oz are steep but things are slow so maybe! Like you the Storm is special to me but variety is the spice of life and the Storm and Duc are the constants for me. Dope! When I purchased the Superhawk, this beast was still 6months out and I couldn't wait. I still want one. I'm a Hayden fan too, so that one is special! Maybe one day. Gorgeous bike. 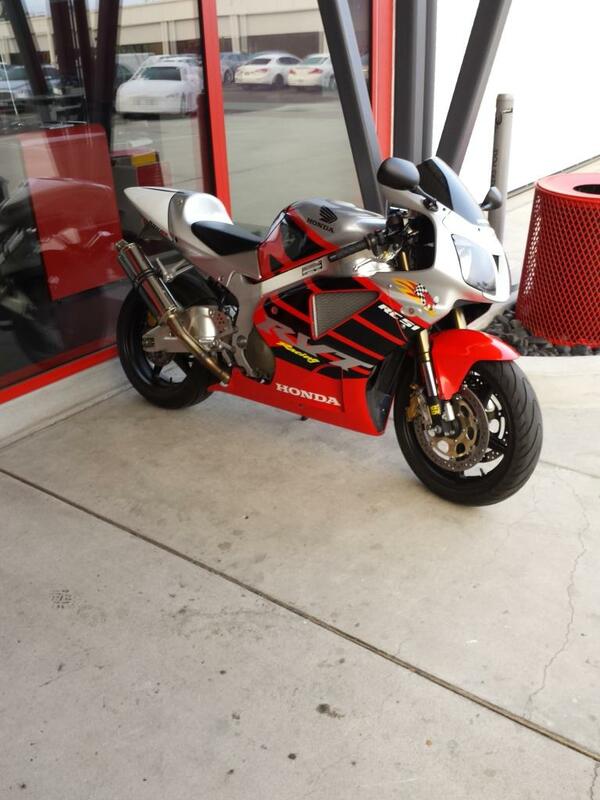 A guy at the track is selling one fully raced prepped but with street fairings. I have always called it the super hawk's stripper sister. I don't know but it seems that the Sp would sort of be like doing your girls younger sister. Not kosher , but fun while you are at it! That's how I feel when I ride the 848 after the VTR! Please let us know how it feels compared to your VTR Scobey. And yes I still hate you you lucky man! Nice bike! Enjoy it. And btw, watch for an issue with wires chaffing near the back of the tank. It left my buds dead on the way to a bike show one year. Last edited by Wolverine; 10-19-2014 at 02:59 PM. The RC made the Smart Money column in Motorcyclist magazine - Dec '14, the Superhawk was in there also! thanks for all the love gents! shes a beauty for sure Mik! been in love with it ever since i was a kid watching edwards beat the Ducs at their own game. Ken, its a whole different ball game with the RC. 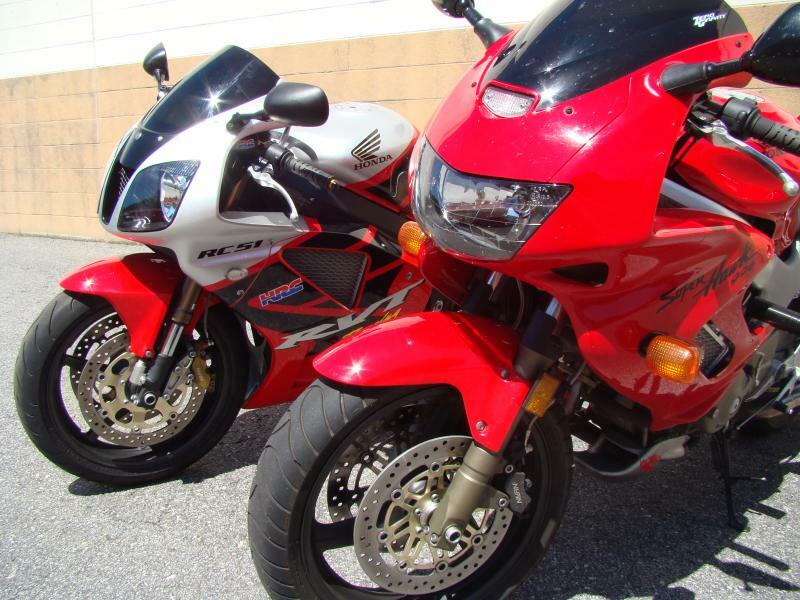 similar power as your 848 but a bit heavier. although it doesnt feel to heavy, just very stable. its hard to really rattle its cages. ive noticed that you deffinatley have to pick a line and stick with it. theres not a whole lot of mid corner correction to be had. but it feels very stable in the turns and completley settled while getting on the gas hard on corner exit. race track pedigree no doubt. i never get tired of the swingarm ha. still though, i ride the badest bikes every day at work and you just cant compare the RC to those. 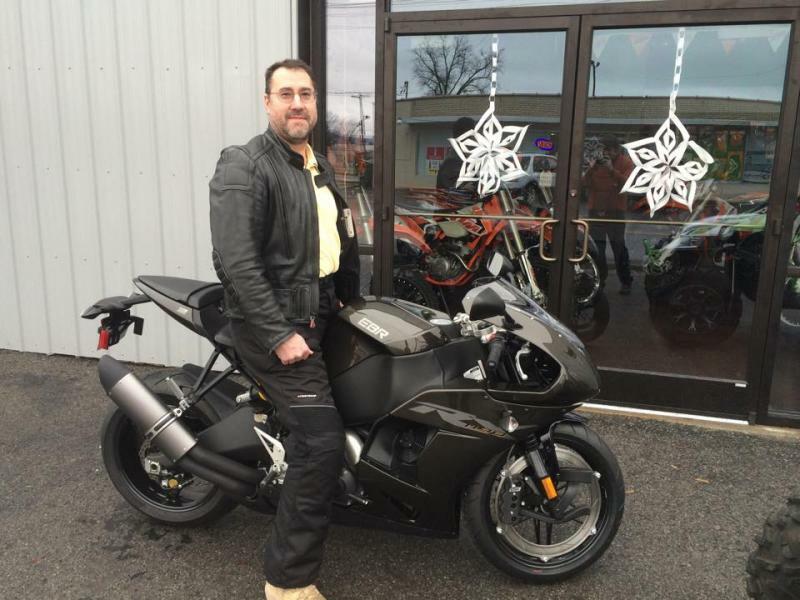 the 1199 is SO light and SO powerful but its almost hard to ride fast. one of our shops racers only does 1 second quicker laps on his 749R race bike vs his 1199 race bike at big willow. sometimes all that power just gets you down the straights a bit quicker but hurts you in the turns. plus im not a huge fan of the monocoque chassis on the Panis. anyway the point being that sometimes its easier to ride fast with less power to the wheel. the RC i think can be compared most to a 999R. thanks for that! checked out his build thread on here. really impressive. thats what im worried about though. theres so many options for aftermarket parts. i will say that the market is probably drying up more than in the past with options for the RC but still much more performance parts available. the fact that the VTR has limited aftermarket parts is sort of nice in that it keeps me from spending rediculous amounts of money. the RC is notoriously expensive to improve on with very diminishing returns after a few choice upgrades. i think the idea that one could make it competitive with modern liter I-4's is appealing but not realistic. but OCMD is a sickness that i have to live with nonetheless. i always envy the guys that can stick a fender eliminator kit and a set of pipes on their bike and be done. I sense you'll for get it every time you twist the throttle.... Nice bike (and dyno numbers)! I'll say he won't (forget it)! That riding position looks quite a bit more aggressive than the Hawk. Nice bike though. Insane torque! Now I just gotta get off my rear and take pics and post up all the VTR bits and goodies I have laying around for all of you to snap up. Sargeant seat, BMC race air filter, 4 ultra oil filters, chain and lower gearing set, fork brace, windshields, helibars w/ brake lines, sparkplugs, brakepads, velocity stacks, trucker manual CCT's, rims set, bearings, headlight bulbs etc. etc. Last edited by LineArrayNut; 12-27-2014 at 06:30 PM. Sweet! Bought back my first bike for a song!